Big browser update day today. Vivaldi Technologies AS released Vivaldi 2.0 to the Stable channel earlier today and now it is Opera Software's turn to release a new stable version of the browser. Opera 56.0 is a usability update first and foremost that introduces several usability improvements. The new version of the browser is already available via the integrated automatic update mechanism. Just load opera://update to run a manual check for updates if Opera does not pick up the update automatically. Select "check for updates" there to download and install Opera 56.0. on the system. Opera users who prefer to download the installer manually can do so on the Opera website. You can check the installed version by loading opera://about in the address bar of the browser (and yes, the About page has a new design in Opera 56.0). 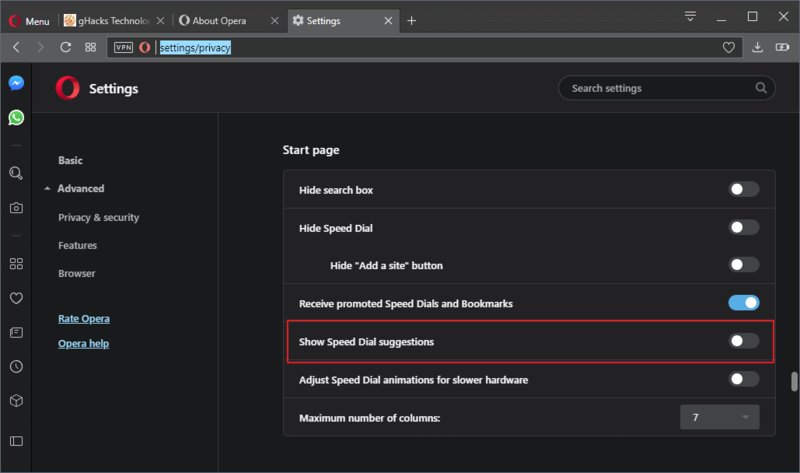 Opera Software added an option to the Opera browser to disable promoted Speed Dial tiles and bookmarks. The browser includes sponsored bookmarks and Speed Dial items which users may remove when they don't require those. Opera Software gets paid for including those meaning that it is one of the revenue sources of the company. Load opera://settings/privacy in the browser's address bar. Scroll down to the Start page section on the page that opens. Toggle "Receive promoted Speed Dials and Bookmarks". Note that this does not affect existing promoted content but ensures that future content that may be added to Opera won't be added to the bookmarks or the browser's Speed Dial section. While we are at it: Opera 56.0 features new settings categories. You find Basic and the Advanced categories Privacy & Security, Features, and Browsers in the sidebar of the settings. The three categories under Advanced jump to specific positions of the settings page but all settings are still displayed on a single page. The browser displays a new page zoom level indicator in the address bar. When you change the zoom level of a page, e.g. by holding down the Ctrl-key and using the mousewheel, you will notice that a zoom indicator is displayed in the address bar. A click on it displays the current zoom level, an option to reset it, and to change it in increments. Opera supports a new "Scroll to the top" feature which scrolls to the top of the page when you click on the active tab. Another click takes you back to the position that you have been at. The feature is enabled by default. Users who don't want it can disable it by toggling "Scroll to the top of the page by clicking the active tab" under User Interface in the Advanced settings. Video Pop Out is a relatively new feature. Opera Software added volume control options to the pop out to give users options to control the volume of the video right from it. Opera 56.0 has been updated to Chromium 69.0.3497.100. Interested users find the entire changelog here. Opera 56.0 is a new stable version of the web browser that was released by Opera Software on September 26, 2018 to the Stable channel. I recently erased Opera 55 from my Ubuntu system since I could not get videos to play at all. I believe that this was because I did not have Flash installed. However, this would mean that I had to install Flash globally for one browser. Firefox plays videos, but needs some prodding. It has the Flash plugin installed. My new daily driver, Falkon, plays videos perfectly. I do not have Opera installed on Windows 8.1 for other reasons. I wonder if the new version of Opera corrects the video issue, but I am not going to find out. Thanks for the article, Martin. It is good to know what is happening. It says that Flash is not installed. So Ubuntu, Opera and YouTube videos in late September 2018 won’t play because “Flash is not installed”? This should definitely not happen =). Unless your Ubuntu is an older version and some dependencies have been removed and linux went sideways while you’ve been tinkering with Flash. That still does make zero sense since YouTube doesn’t need Flash.. You’re on your own buddy. Reinstall Ubuntu. @Mark Hazard: I think it is HTML5 that is the problem for Opera. BTW I have Falkon as one of my back-up browsers on my Win 8.1 system and quite like it. Opera tends to have problems with html5 video on linux because it doesn’t bundle h.264 codecs like google chrome does. Afaik, on ubuntu if you install the Opera snap package, it should automagically install the appropriate chromium ffmpeg codecs for opera to use. Opera has released their browser as a snap for a reason. No package mess with chromium codecs, flash etc. Try it, it works perfectly and you don’t need to install all these ppa nonsense. I thought about switching from Opera to Vivaldi, but I don’t like when a browser is too experimental and changes things all the time. I want consistency. The Opera team is very innovative and is doing all the right things. It’s the small things like “Scroll to the top” that make a difference. They are very open how the make money and this option to deactivate suggestions shows they try to keep it acceptable. I think more software makers are realizing that it doesn’t really affect their monetization when they give users the option to opt-out, since only a tiny minority does it. On the other hand, not having the opt-out option will drive those users away that are very important for buzz marketing. In general the way how Chromium handles basic and advanced settings is clearly a dark design pattern introduced by Google: There is no reason for burying the advanced option, except hiding user-friendly features. Were you talking about the old Opera team? They’re on Vivaldi now. There’s nothing innovative in new Opera, that scrolling feature was already in Yandex Browser and can be installed with extension on other browsers. Innovation isn’t exclusive to a single browser. The only browser that is fundamentally innovative is Brave Browser, but mostly in theory, as a concept. What’s cool about Opera is just like others (Yandex, etc.) they don’t hide that they monetize everything that’s possible. Search, links, ads, probably selling VPN/Turbo data and all kinds of statistics to aggregators, and what not, if you have certain settings activated. I can already see the problem with Vivaldi on the horizon when they stop growing, and have to rely on Google 100%. This reliance makes a browser maker a slave to google and stops innovation in its tracks. Either they won’t get away from Google or they have to start making strange acrobatics like Mozilla is doing nowadays (Pocket, etc.). DuckDuckGo will certainly not give them enough money, and even Bing is probably a joke compared to Google money. This hypocritical mental gymnastics is what puts me off when it comes to those products, among other things. I can tell you, Pocket is a disaster. Pocket grows as a company because Mozilla pumps money into it, not because they have a good product. It will implode badly. Vivaldi will definitely encounter similar problems. How long can you innovate in a competitive market if you cannot hire good costly engineers? They are not even in the green yet, and stagnate at around 1 Million users. 2 years ago the founder said they were in the red. They can promise privacy as much as they want, at the end of the day they sell all of their users data to Google, and even that isn’t profitable for them. Google is already preparing to lose some of it’s the ad-money, because it is clear to most people in the industry that Ad-Tech will implode under the new global privacy regulations and protest culture. Those browsers with the custom CSS UI like Opera and Vivaldi are a mess. Both have issues on Windows 7 where you can use Aero Basic and Classic themes as an alternative to Aero. Whereas in Windows 10 there is only Aero with the “aero blur” part removed. In Aero it works fine, but in Aero Basic and Classic there are some issues, like when you leave a full screen video in Opera it shows an empty space between the tabs and the edge of the screen, you have to click on another tab to make it go back to normal. I’ve been saying those issues persist for over 12 months and it’s not fixed. Chrome and Firefox don’t have such issues, I think that such browser as Vivaldi and Opera are garbage because of their lazy and incompetent developers. No, Vivaldi and Opera does not have dumb and incompetent users in their target who doesn’t have a clue about how software is developed. Those who know what a power browser is, which gives users options, are perfectly fine using them. They have apparently done weird things to the bookmarks bar now.. I have a long row of bookmarks, icons only, that used to fit perfectly end to end on a 1920×1080 screen. But now they don’t fit anymore, and there’s no hover-over icons effect present anymore either..while using light UI, on dark UI there’s a very slight hover-over effect. Oh well, maybe they will “fix” this or maybe it’s a feature =) I still love Opera, ditched Chrome on all my computers over a year ago and have had zero regrets! Highly recommended. I have some more modern version of Opera laying about. But, I’d had to stuff the thing in a sandbox and never use it, now, as the damned thing kept trampling all over my installation of v12. I’ll probably dump it, totally, when I can be arsed. Good job I make regular backups quite often. ‘tiz a shame, coz the original Opera was exceptionally good. Still is. There’s only one site that I visit, which borks it. I’d love to know why they REALLY switched engines. I guess the answer’s $$$. v12 and it’s predecessors have always been my default browsers, but I use Vivaldi a lot, now, too. The funny thing about Opera is it’s almost impossible to find the option to make it the browser by default, unless you activate it the first time you launch the browser and it’s presented to you. All other browsers I use put that option prominently, tight on top of their settings. Obviously. Activate the “if Check Opera is default browser on startup” thing. Odd way of doing it, though. It’s a similar palaver with v12, too. I love the Speed Dials on Opera and this is one of the stand-out reasons I use it, along with WhatsApp and Messenger integration. Although Opera is interested, the biggest bottleneck is that it is a “Chinese company” browser. In July 2016, it was acquired by 奇虎360 (Qihoo / Beijing), became affiliated companies. In China, NSA similar and state control is thorough, fundamental human rights of the individual (protection of privacy) has become a neglected. Opera was sold, and the business policy such as rendering engine was changed from “Presto of original development” to “Blink of Google development” was enforced. Major members of old Opera engineers, opposed to this, retirement. They are rallying together and trying to restart at “Vivaldi”. Considering those circumstances, I hold suspicion in current Opera.